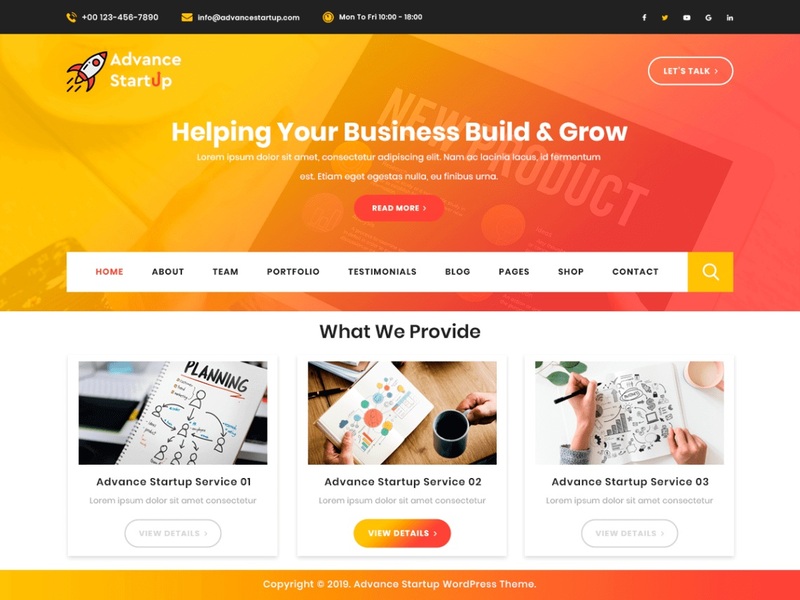 Advance Startup is a resourceful, feature-rich, stylish and versatile startup WordPress theme to build high quality websites for startups, IT companies, entrepreneurs, joint business ventures, web development agencies, digital marketers, tech startup, online shop, innovative advertisers and ad agencies, corporate companies and newly establishing businesses of all scale and scope. It is a multipurpose theme which can be used as a startup blog or for resumes, journals, and magazines. Being customizable, its look and feel can be changed by changing its color, background, font, header and footer format, menu style, logo, and various other components without indulging in coding. This startup WordPress theme is responsive, retina ready, translation ready, multiple browsers compatible and readily supports languages of RTL style. It is totally compatible with the recently launched WordPress version and has a bug-free code. Its background interface is simple to understand and even simpler to use to set up and start using the theme for any website irrespective of your coding skills and knowledge. It has many layout options, all giving a perfectly professional look to a website with utmost ease. Advance Startup is designed with a beautiful and attractive homepage slider, call to action (CTA) button, several sections and many useful predesigned inner pages.